Irish Distillers launched Redbreast 21 year old last night in London, with Midleton distillery's Master Blender, Billy Leighton, leading the tasting. That's already the third new single pot still whiskey this year (after Powers Signature Release and Paddy Centenary). The press release says it's the ninth in total but I've been totting it up and I reckon there are ten on the shelves now (or very shortly): Green Spot & Yellow Spot; Redbreast 12yo, 15yo, 21yo & Cask Strength; Powers John's Lane & Signature Release; Midelton Barry Crockett Legacy and Paddy Centenary. There are even rumours of another "colourful" pot still on the way (*cough*). As the oldest and richest expression in the decorated Redbreast family, Redbreast 21 Year Old is the finest representation of the brand's signature sherry style. It is made from a mash of malted and unmalted barley, triple distilled in copper pot stills and matured in a combination of American Bourbon barrels and first fill Spanish Oloroso sherry casks. Billy Leighton, Master Blender at Midleton Distillery, said: "Redbreast 21 Year Old is a very special Single Pot Still Irish Whiskey and one of which I am immensely proud. Once my team and I tasted the 21 Year Old whiskey, there was never any question about whether we should release a younger expression - the older whiskey showed such stunning levels of depth, flavour and taste, we just had to bring it out for the growing army of Redbreast and Single Pot Still Irish Whiskey fans around the world." There is a really strong Redbreast line-up now. Many rate the 15yo and Cask Strength among the very finest Irish whiskeys (as do I) and the Redbreast 12yo is not all that far behind, even at 40% ABV. So the 21yo has a lot to live up to and it would be interesting to pit it against the rest of its family. 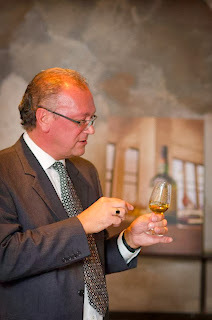 It looks like visitors to Whisky Live Dublin next week will have that chance at a masterclass. Redbreast 21 year old is 46% ABV, non-chill filtered and available in "very limited quantities". It's out this month in the US, France, UK, Ireland and Germany, priced at $180. Remarkable aroma spanning fresh tropical fruits, nuts and rich dried fruit. Soft vanilla, toasted oak, sherry nuttiness with a dusting of Pot Still spices. Luscious fleshy fruit notes complete the creamy mouth feel. Lingers, seemingly forever, to oak and pot still spices and then, the final bow from the Barley – where it all began.